Forging a universal doctrine from the divergent traditions of China, Sri Lanka, Japan, Burma, Thailand, and Tibet, the makers of modern Buddhism saw it as a return to the origin, as renowned scholar Donald Lopez shows. Modern Buddhism is for them a homeward journey to the vision of Buddha himself. Putting far more stress on meditation and spirituality than on ritual and relics, it embraces the ordination of women and values of science, social justice, tolerance, and individual freedom. 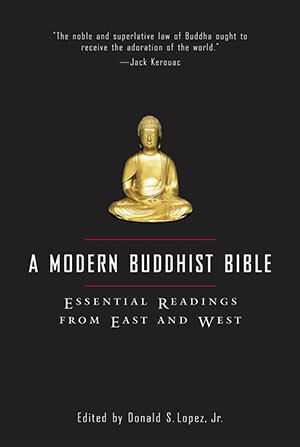 A Modern Buddhist Bible includes writing by Jack Kerouac, Allen Ginsberg, William Burroughs, the Dalai Lama, Thich Nhat Hanh, T’ai Hsu, Cheng Yen, Shaku Soen, D. T. Suzuki, Alan Watts, Gary Snyder, Shunryu Suzuki, and others who have played a role in the rich and complex movement that fused Eastern insight with Western consciousness.